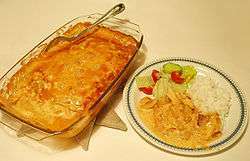 Flying Jacob (Swedish: Flygande Jacob) is a Swedish casserole that consists of chicken, cream, chili sauce, bananas, roasted peanuts and bacon. In the original recipe, the chicken is seasoned with Italian salad seasoning. The dish is cooked in an oven and is usually served with rice and a salad. The dish was invented by Ove Jacobsson who worked in the air freight industry, hence the name. The recipe was first published in Swedish cooking magazine Allt om mat in 1976.